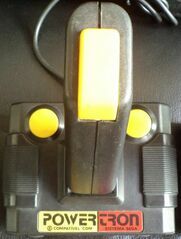 The Powertron II is a joystick for the Sega Master System released in Brazil. It is part of a range of joysticks for various systems - the Powertron I, III and IV are virtually identical, but were built for the Atari 2600, NES and Dynavision II, respectively. Main article: Powertron II/Magazine articles.